Who's Got One? | How Does It Work? | No Side Effects | Immune System | Stress Protection | Environmental | Therapists | Improvements | Solution | Paradox | Indispensible Asset | How to Get One! Every day, for over two years before I created the first Energy Egg, I had to inject a medication into my left shoulder to control an infection that had invaded my cervical spine, ever since a trip to Mexico five years earlier. Once the first Energy Egg was activated, I immediately ceased the injections – it seemed like a good test for the prototype – and discovered that I no longer needed the injections or oral medications for the infection. Soon after, a colleague in Australia, who was suffering from systemic polyarthritis and had been told that he would never walk again without the aid of a walking stick and daily doses of Celebrex, had an equivalent experience once he received his Guardian Energy Egg. He no longer needs a walking stick or any drugs. Thousands of people have started using this generation of Guardian Energy Eggs, many of them experiencing dramatic relief or recovery from a wide range of symptoms or diseases including insomnia, fatigue or chronic fatigue syndrome, allergies, depression, asthma, stress, electromagnetic field sensitivity and much more besides. Please feel free to write to me with any questions arising from this article. In order to understand how the Guardian Energy Egg works, we first have to consider the subtle energies, known in the East as "chi", "qi", or "ki", that underpin our ability to function in every possible way. Although Western scientific instruments have yet to be developed that can measure these energies they have, nevertheless, been observed, measured and employed within many cultures over thousands of years. As I write this article, I am looking at a flat screen (TFT) computer monitor. The monitor is emitting two signals that attack my eyes and heart. Both environmental stresses damage the 6th chakra – the energetic organ that controls the frontal lobes of the brain and the autonomic nervous system – in a way that weakens its ability to make two forms of ki that sustain the health of the eyes and the heart. Fortunately for me, when the stress signals emitted by the monitor come within approximately one metre of my body, they are met by a form of ki that causes them to start flowing downwards at an increasingly sharp angle. Eventually they're falling vertically, long before they can reach my body and do any damage. This form of protective ki is automatically emitted (to a greater or lesser degree) by everyone's crown chakra, which covers the top half of the head, in response to any incoming environmental stress that it detects. 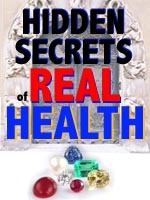 The body's natural energetic immune system if you will. The reason my crown chakra is so effective at managing the stresses emerging from my computer monitor is that I have an Guardian Energy Egg sitting on its transmitter downstairs which amplifies my crown chakra's ability to protect me from environmental stress. Before I had an Guardian Energy Egg, I suffered from RSI, brain fog, eye strain and other symptoms through sitting in front of a computer for hours. 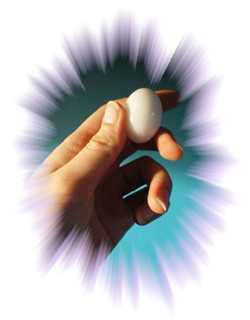 The White Guardian Energy Egg doesn't just help the crown chakra respond to incoming stresses like 'computer monitor stress', it also strengthens and repairs the crown chakra itself over time. The forms of ki contained in the Guardian Energy Egg assist your crown chakra to identify and eliminate accumulated environmental stresses from within itself, to heal itself. The more it does this, the more the protective function of your crown chakra for your entire energy body is restored. Each chakra emits different forms of ki in response to different energies. The Guardian Energy Egg is based on a precise understanding of how the human body responds to different areas of its energetic environment. It then provides your energy body with ways to improve the strength or quality of its response to environmental energies – while giving it complete control through a highly sophisticated feedback process over the Guardian Energy Egg itself. Your energy field fills a large ovoid space reaching from below your feet to as high as you can reach above your head. Your energy body occupies the same space as your physical body. The chakras of your energy body are designed to pick up or sense any signal that enters your energy field. The crown chakra is the biggest and most complex signal generator in the human energy body. Whenever your energy field is attacked by an environmental stress, your crown chakra attempts to ground it out with one of three forms of ki – known as ati, imsarg and echifv respectively – before it reaches your energy body. The average crown chakra is very effective at grounding out incoming stresses but nowadays it has an increasingly tough job on its 'hands'... you simply can't get away from environmental stress. It's influence is now all-pervasive. In the 20th Century, background EMF radiation increased by more than one thousand times – and it's growing faster now than ever before. The crown chakra, even if it wasn't increasingly being impaired by the natural aging process, isn't able to keep up with this rate of increase of harmful environmental energies. If everyone's crown chakra worked as well as is needed, no-one would have any adverse reactions to electromagnetic fields, other peoples energies, geopathic stress, 'sick buildings' or many other environmental stresses or sources of stress. But we do and thus our crown chakras need some help in this increasingly environmental stress-filled world. Unfortunately, a baby's crown chakra starts suffering the stresses of life even before he or she is born. This is because the baby is exposed to many of the same stresses the mother is experiencing – including some of the stresses generated by its parents! – which begin to damage its crown chakra even before birth. Our energy bodies have enormous recuperative powers but we slowly and steadily accumulate microscopic lesions in our chakras that eventually manifest as physical, behavioural, energetic, emotional, mental or spiritual impairments of one kind or another. And the more your crown chakra is damaged, the less able it is to protect you from some of the everyday environmental stresses that others may appear to handle with so much less effort. Environmental stress accumulates in all of us, creating an increasing 'stress burden.' Some people have some sense of being affected by their stress burden – and so are motivated to do something about it – while others are unaware of how they're being affected until they succumb to its influence. Ideally one should be energy-sensitive without being energy-vulnerable – sensitive enough to be aware of environmental energies but without being damaged by them. This is why we offer trainings such as the Energy Awareness Training and the more advanced Vision Feng Shui Training. It's also worth bearing in mind that environmental stresses can affect any area of your life (relationships, creativity, happiness, security, etc. ); not just your health. And the stresses or foreign energies received from other people – parents, lovers, colleagues, clients, etc. – are often more harmful than those received from electrical devices or other well-known sources of environmental stress. Some people use mental or physical techniques to protect their energy bodies from others' energies. Unfortunately, these methods often only serve to mask the accumulation of foreign energies. Indeed, amongst the hundreds of healers I have seen as clients over the last 25 years, I have yet to see anyone demonstrate such a technique that affords more than a partial protection, for small areas of the energy body, against only one or two forms of foreign energy... The downside of such technqiues is that they all too easily lull people into a false sense of security by numbing the very awareness that could, otherwise, alert them to how they're increasingly being affected by others' energies. Another unique function of the Guardian Energy Egg is that you can personally re-tune it to any particular form of stress you are experiencing. Let's say that, due to an unusual personal vulnerability, you are reacting to someone at work such that you feel uncomfortable or even ill when you're near them. This all-too-common experience occurs for exactly the same reason so many people are affected by their computer monitors or mobile phones – the signal penetrates your energy field and your crown chakra is unable to fully ground it out. You are, literally, being energeticaly poisoned by, in this case, another person's energy. We have received a great deal of feedback from Guardian Energy Egg users who've found they can stop a reaction dead in its tracks with the Energy Egg's personal re-tuning technique. Or, from those who are more pro-active, how they can prevent a known reaction from occurring in the first place. The three benefits of stopping reactions to environmental stress, becoming more 'chilled-out' and simply having more energy are the ones most people notice even if they aren't particulary energy-aware. If you are energy-aware, you will sense your energy expanding or perceive your energy field becoming brighter while holding your Energy Egg. These effects result from your 7th chakra's increasing strength, which generates a higher quality interaction with your clients. Of course, this technique is just as useful when interacting with anyone at all. Varying degrees of personal vulnerability to certain forms of energy is one of the reasons scientists have such difficulty understanding environmental stresses or how to respond to them – individual vulnerabilities can be very different from one person to the next. Also, powerful sources of environmental stress – such as electricity sub-stations – have very different effects on the local environment depending on the energies of the places where they're situated. This is why the Guardian Energy Egg was designed, from the ground up, as a device that is wholly controlled by its owner's energy body – rather than imposing a signal upon the body from outside. The crown chakra only calls upon the Guardian Energy Egg when it needs some support – just as you might choose to take a supplement or receive a massage whenever necessary. Any effective therapeutic intervention inherently strengthens clients' energies – thus reducing their energetic vulnerabilities. An Area Guardian Energy Egg or Guardian Angel amplifies a therapist's or healer's influence on his/her clients by reducing the levels of environmental stress and foreign energies in the client's energy fields. The less stress there is in someone's energy field, the more they are open and receptive to effective healing interventions. One phenomenon that is now being experienced by millions of people is that of electromagnetic hypersensitivity. This problem, which is already a pandemic, manifests as a wide range of symptoms from fatigue or depression to complete disability or potentially fatal disease. Mobile phone transmitters, computers and WiFi systems are just three of the well-known sources of the electromagnetic smog by which hypersensitive people find themselves increasingly beseiged. A Guardian Angel offers the additional benefit of eliminating the stresses received from electrical devices and many other sources of environmental stress. In fact, a woman who has been portrayed by the national media as the most electromagnetically hypersensitive person in the UK recently called to say she was no longer reacting to electrical lights, sockets or even the equipment in her local supermarket. And that she was thinking of going on holiday... she had received a Guardian Angel two days earlier. With this 6th chakra tapping technique, your 6th chakra will draw upon the Guardian Energy Egg to clear some of the stable stress in your energy body that prevents you from resolving the problem. By making this a habit, you will eventually clear enough of the stress to see what you need to do relative to your problem or question – and have the energy to do it! How does this work? By focusing additional ki in your 6th chakra – which has been reinforced by the Guardian Energy Egg – on the stable stress underlying the issue. The stronger your 6th chakra's energy becomes, the more the accumulated stress will be drawn down and out of your body. Many people have difficulty understanding the idea of an energy that isn't accounted for by Western scientific concepts. However, it's worth bearing in mind that science, for all its virtues, is very much the "new kid on the block" when it comes to understanding the physics or energetics of human energy. By first developing a clear perception of human energy then seeing how it's affected by environmental energies, we can create far more powerful energy solutions than ones based on theories about energies measured in isolation from the human body. This way, we can make the Guardian Energy Egg increasingly available to everyone. It isn't only the most powerful energy protection instrument that exists – it's also continually upgradeable even after it's been bought, because it is automatically and manually controlled by both your energy body and you. After reviewing over eighty "energy protection" products at Energy Solutions – and being unable to find anything offering whole-body, non-stressful, energy protection – we redesigned the original Environmental Stress Eliminator as the Guardian Energy Egg. This was because our clients needed an effective solution to the growing menace of electromagnetic pollution as well as to so many other forms of environmental stress that affect us all – including other peoples energies and entities of one kind or another. Since then, since so many Guardian Energy Egg owners have discontinued their use of other products, we have come to realise that the Guardian Energy Egg is destined to become an indispensible lifestyle asset for every energy-aware, health-conscious individual.